Nope, this isn’t going to be one of those flamebaits trying to convice you which one is better. 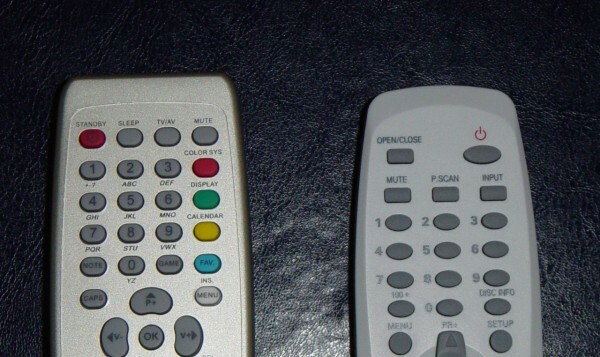 Each night I turn my DVD recorder off using its remote control (I use it to switch channels instead of TV’s one). I usually do it in the dark, and I usually open the disc tray first before cursing the fact that the power off button is on the other side. Other from what? Well, from TV’s remote which I used just a few seconds before - to turn TV off. There’s obviously no standard between makers of TV sets and DVD recorders, but this thing often reminds me of a similar issue in software: the button placing in KDE and Gnome. For those of you how don’t know, KDE and Gnome have different standards on button placing in dialogs. Beside other minor things, OK and Cancel buttons are at opposite places. Of course, both camps are right, and there is no standard here, just what you might get used to. Many people get annoyed by Gnome’s positioning because it is different from MS Windows. I’m not one of those people, but I do get annoyed when two applications I’m using simultaneously have different setting. It all goes down to underlying toolkits: Qt and Gtk. Now, in my not so humble opinion, instead of trying to duplicate each Gtk app in KDE, and each Qt app in Gnome (often in much worse quality) developers should play smarter and get apps to adapt to the environment. It would be cool if Gtk and Qt could simply ask the window manager: “what is thy button placing preference?”. If it doesn’t respond (i.e. doesn’t have it), it would use the default placing used so far. Otherwise, the appopriate placing would be used and if I’m using KDE, then Gtk apps. wouldn’t stick out. Conversely, if I’m using Gnome, Qt apps would blend in.